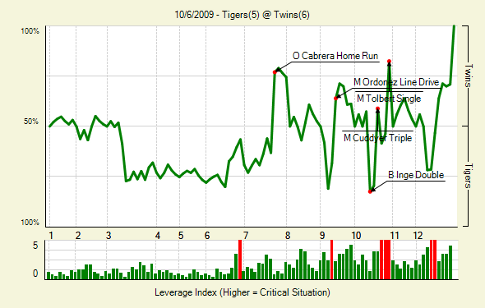 One of the coolest things about Win Expectancy, in my opinion, is the way that it can be graphically represented. Of course, most people reading this post will know this from the classic Win Probability graphs we have here at FanGraphs. With this graphical representation, we can investigate beyond the simple line on the screen using the branch of mathematics known as analysis. Analysis, better known as calculus, is used to solve two problems. One is finding the area contained under a curve, and the other, which will be used in this post, is to find the slope of a curve. In physics, if a graph is presented with time on the horizontal axis and position on the vertical axis, such as this graph (LINK) from HitTracker Online, the slope of the curve represents the velocity. Similarly, the slope of the line of a Win Probability graph in a way represents the “velocity” of a baseball game. A Win Probability graph is composed of broken line segments, with each line representing the WPA of a play in the game. The slope of each line segment is then equal to the WPA of the corresponding play. Unfortunately, we can’t find the slope at the point where the broken line segments meet, because the slopes are different on each side of these points. In order to counteract this, we need to model the Win Probability graph with a curve. In this case, I choose to use something called a cubic spline, because it’s both accurate and relatively easy to compute with mathematical software. This makes it possible to find the slope at the points between the plays by taking the derivative of the curve. Let’s show this with the 163rd game of the Twins and Tigers. Below is the graph for that game. Here is the win probability graph with the derivative, or “WE Velocity” on the same scale. Win probability is set so 0 = 50% for both teams so that both graphs can be shown on the same axis. So you can see, even when the game appears stagnant in the early innings, there are still quite a few minor tosses and turns in the game. What really stands out, however, are the massive peaks and valleys towards the later innings, where each individual play has a massive impact on the end of the game, as we can also see just with simple WPA. Near the end of the game, we can see the game start to really take off, as WE velocity reaches as high as 23% of a win per play. Some other interesting points are those where the derivative crosses the horizontal axis. Those are turning points, as they indicate a local maximum of win probability for one of the teams. The major turning points typically come after extremely high points of WE Velocity. 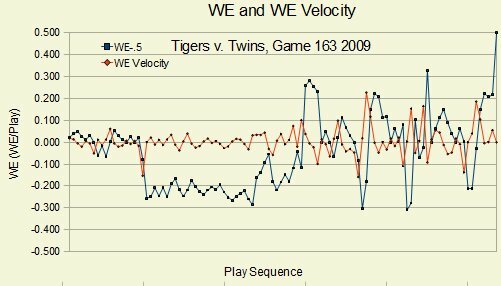 For example, between play 99, in which Don Kelly singled and advanced on the throw to third to put runners on first and second in the top of the 12th and play 102, in which Gerald Laird struck out to end the inning, the win velocity went from 13.8% of a win per play in favor of the Tigers to 18.7% of a win per play in favor of the Twins. The Twins would go on to win the game in the bottom of the inning, and one might even surmise that the unfortunate end of the inning for the Tigers took all of the air out of their sales. I don’t know if this is particularly useful at all, but I do think it is an interesting thing to see the peaks and valleys of a baseball game quantified. If there are any games in particular you would like to see this analysis with, please leave a message in the comments section. We hoped you liked reading Analsyis and WPA – WE Velocity by Jack Moore!